Everywhere we traveled there was much beauty. From the people in the neighborhood to the vast jungle which came right up to the road, to the blue-beyond-description of the Caribbean Sea. With the exception of the archaeological sites we visited, we saw few tourist as we went in fall when few tourist travel there. 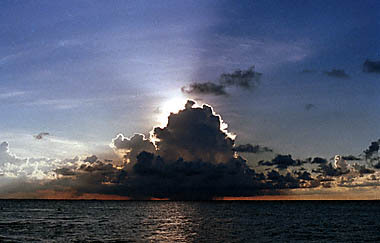 Photo by Bill McKee Just north of Cancun and just 5 minutes from 'home' is Porta Juarez, left. 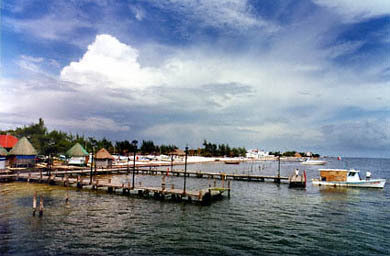 From here it is only a short ferry trip to Isla Mujeres, the Island of Women, east across the Caribbean Sea. 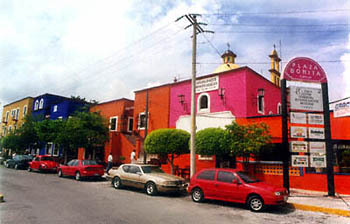 One day Patsy and I had traveled with Javier south from Cancun along the coast to a village called Playa del Carmen. Parting company; Javier headed into the jungle to visit his brother, Patsy and I wandering the streets and experiencing life around us. 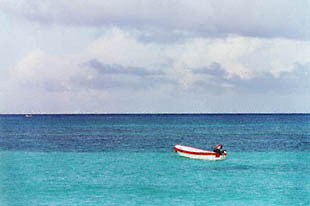 Late in the afternoon we found a lone boat (left) anchored after a day on the sea. 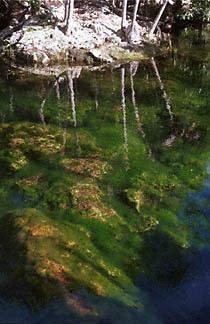 Photo by Bill McKee Reflections on crystal clear water, left, exemplify a cenote, a fresh water pool. There are no rivers on the Yucatán Peninsula but many cenote's connected by underground rivers. 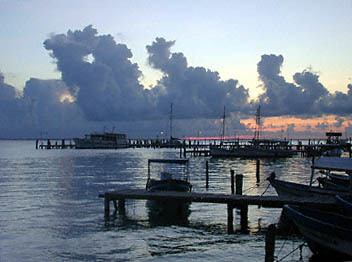 The following four photographs were taken in one afternoon on Isla Mujeres. A day filled with beauty stretching into eternity. It began early in the morning at Javier's home, Monica making chicken salad, Javier gathering swimming suits for the kids, cooler, etc. Patsy and I making sure we had plenty of film and frozen water bottles. A short taxi ride to Porta Juarez, 15 minute ferry ride across the Caribbean Sea brought us to a beautiful island, village full of shops, and a short walk to north beach. Swimming and playing with the kids in the calm, warm sea, sitting under large umbrellas, eating some of the best chicken salad I have ever tasted and the scene changed constantly all day. Mid afternoon a yellow sail boat passed just off the beach. 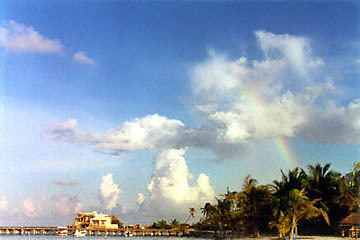 After a mid-afternoon shower a rainbow appeared, reaching south towards the city of Cancun. Heading back home after a day on the Island of Women, Isla Mujeres, we were waiting for the ferry in the early evening light just after the sun dropped below the horizon. 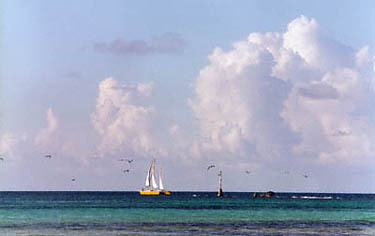 A storm passes west from the northern beach on Isla Mujeres.